One of my big fears returning to ballet class after so many, many months off was the notion that it would very much be like starting from scratch. After all, I haven’t been at this pursuit all that long in the first place and my learning curve with ballet has been frighteningly steep. Let us just agree that I am not a natural when it comes to dance. Well, to my great joy, I’m not starting from zero. Both my brain and my body remember more than I expected. I’m still trying to find my arms and legs – in moving combinations my feet still feel a little lost and my arms sort of drift around looking for their correct placement. Now because I’m still trying to work out how my foot will react to dancing, I’m still in a sort of trial phase. I believe that I’ve found a good way to tape that allows me flexibility but also offers the support that I still need. So I feel pretty good about that. My teachers and I have agreed that it’s best to dance on flat feet to start back and build strength back in my feet by dancing with minimal impact. So everything might have to be re-adjusted as I go back up on my toes… hopefully I can start working into that in this coming week. Dancing on flat feet has been challenging! Every little bit of training in me wants to get up there in relevé! But as I’ve been given a sort of fresh start, I’ve decided that it’s a great opportunity to try to deal with some of my very bad habits and try to readjust my approach to dancing. Amazingly, I’ve been doing pretty well with my major bad habits. Looking down and watching my feet. Following other people in class. Getting overwhelmed with each individual step so that I end up hiccuping through a combination rather than flowing and dancing. Not using the mirror well. Tensing up instead of extending and reaching. Losing my turnout and short-changing my pliés. and to my great surprise and delight Patrick de Bana responded with a laugh and words of wisdom. Words that really made me think about my approach to class. I have been thinking about “learning” in terms of rote learning, learning individual steps by virtue of tons of repetition, corrections, and more repetition. 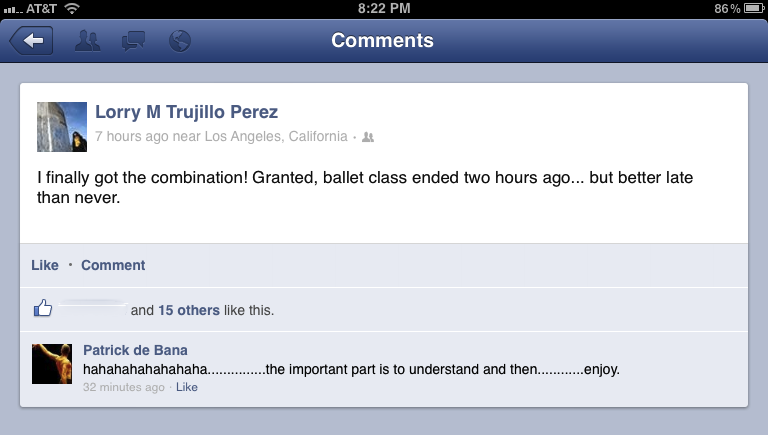 And this is how ballet class works, yes, but I think that learning by “understanding” is a whole other mindset. It’s still tons of repetition, corrections, and more repetition but it’s up to me to engage in understanding. Understanding the movement, the music, the relationship between the two, what I as an individual dancer can and should be doing – which as much as we strive to be cookie cutter perfect – is still part of our jobs as adult dancers, to work to find our limits and then to safely push past through them, to discover dancing and not just steps. I don’t want to just learn how to do a pirouette or a pique or a rond de jambe. I want to dance. I want to understand dance as a dancer. I love this! How awesome. Yes, let’s understand…….and enjoy!! !